Research scientists are frequently on the lookout for concepts concerning the city of the future. How will we travel? How will we shop, and how will our lives become more secure? A workshop report from China, where scientists are counting primarily on intelligent data management. The device looks like a normal vegetable scale. But inside it a computer is hidden that prints out a purchase bar-code regarding the origin of carrots, broccoli or spinach. If the vegetable is rotten or wilting, the buyer can track the origin of the goods back to the producer. About 100 supermarkets in the central Chinese city of Wuhan have already installed these devices, says Li Huimin, Vice-President of the Peking Firm GCKS. Together with a Peking University, the enterprise developed this special scale. “So many people in China are concerned about the safety of the groceries”, says Li. The numerous scandals concerning impurities have made consumers insecure. If the sinners can be tracked down with the aid of this scale, it should work as a deterrent. The Firm GCKS is developing many such products, with which they are aspiring to transform cities into so-called Smart Cities. Their portfolio extends from cloud-platforms for huge mountains of data in city administrations to public WiFi stations to digital control of street lamps. Smart City – this term obviously means more than just digitalisation of individual subdivisions in a city; the goal here is integration of all data streams. The huge mountains of data gathered from various sources – called “Big Data” – are being re-packaged into new applications, in order for cities to generate improved performance for their citizens. This would include, for example, “Open Data” (i.e. free access to urban administration data), as well as intelligent power-supply grids and traffic solutions. Smart Cities have become an important topic all over the world for research scientists as well in recent years; the unstoppable influx of in-migration into the major cities has presented science with unforeseen challenges in, for example, development of the appropriate infrastructure, sufficient supply or the development of innovative living and employment concepts. “In 1975 only 38 percent of all humans were city dwellers. Since 2008 more than half of humanity lives in cities; by 2030 this will presumably grow to two-thirds”, as claimed by the research project Future Megacities, which was initiated by the German Ministry of Education and Research (BMBF). The concept of Smart Cities is intended to find more efficient solutions for problems, than was heretofore possible, by means of cross-linkage of the various administrative offices – not only in megacities, but there as well. An example: even now many cities in China display up-to-date traffic congestion on electronic billboards. If the congestion reports were networked with the vehicles, cars in the future could be selectively re-routed to avoid congested areas. Particularly in the transport sector, there are many ideas for user-friendly individual solutions: research scientists have developed an application in Beijing that displays all electric-car charging stations in the city – including the distance to the driver who is looking for such a station. This makes sense, since there are heretofore not very many charging stations. “The application is supported by our Big Data Centre for electric cars throughout China”, says Sun Fengchun, Director of the National Engineering Laboratory for Electric Cars at the Beijing Institute of Technology. A large electronic monitor in his institute displays a street map of Beijing, on which the 300 city electric busses, electric sweepers and other municipal utility vehicles are moving. Such data pools are, according to experts, useful in order to extrapolate models for other cities that would like to introduce electric busses, for example. According to the opinion of mostly Western experts, however, the inhibition threshold for storing large amounts of data is considerably lower in China when compared to the West, where a measure like this would immediately trigger debates regarding data protection. 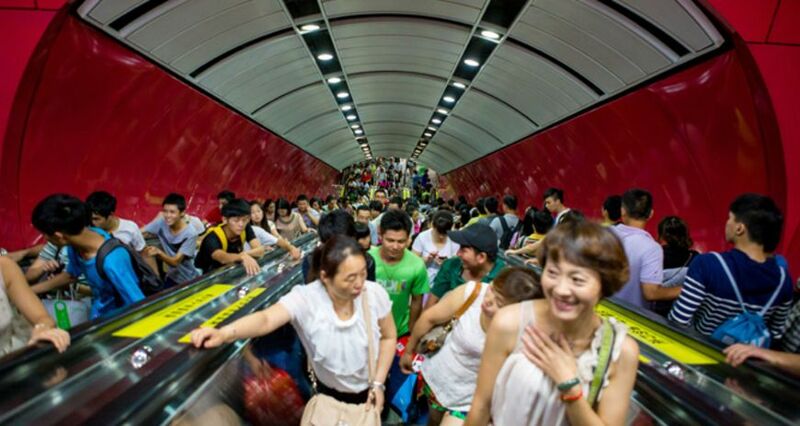 How the increasing urbanisation looks statistically, can be observed today in China. Since the economic liberalisation began 30 years ago, more than 500 million Chinese have moved into the cities. The rate of urbanisation currently amounts to 53.7 percent, and by 2020 this should rise to 60 percent according to a recently presented urbanisation plan – this means 90 million more city dwellers. It will cost about 40 billion Yuan (approximately 5.5 billion euros) to implement this official urbanisation plan, and the money flows primarily into development of the necessary infrastructure. In Germany, “Smart Houses” counted as vanguards for an energy-efficient construction method and building usage. But they also stand for the digital (remote) control of the building and the apartment. “Numerous manufacturers of heating and climate-control facilities, large devices and lighting installations are active in this area. Some initiatives are focused on the market of older people, in order to offer them diverse support systems within the house”, says Caroline Kramer, Professor for Human Geography at the Karlsruhe Institute of Technology, belonging to the Helmholtz Association. “Such intelligent houses are attractive to technologically-savvy people, who have to have both the skills to deal with the respective technology as well as the financial resources for the currently still expensive facilities.” Since the Smart House is controlled primarily by smart phones and tablets, with which the next generation is familiar, an increased dissemination of smarter home-technologies is quite probable. “Which functionalities would actually establish themselves over the long-term, and which would merely cause a publicity stir for the short-term – time will tell”, says Kramer. In China – as is the case in the EU – applications in the fields of environment, energy and transport are favoured. This is the key statement from a comparative study regarding Smart-City pilot cities in China and Europe, which was published by the EU Commission and the China Academy of Telecommunications Research. As regards development of open data systems and cloud computing, the EU cities are allegedly still a bit ahead of the Chinese cities. According to the study, the central government in China is furthermore more strongly involved than in Europe, where the cities in most cases make their city-planning independently. According to the will of the city-planners, in China the in-migration into the megacities is supposed to be “strictly regulated” – in other words, limited. This is because Beijing and Shanghai already have 20 million inhabitants each, while Guangzhou and Shenzhen in the deep south are at 10 million each. In-migration into smaller cities on the other hand is supported. And they are supposed to be better networked; by 2020, all cities with up to 200,000 residents shall obtain rail access, and according to the plan all cities with up to 500,000 residents shall receive connection to the high-speed network of the railway system. “Since the smaller cities are the primary focus of the urbanisation programme, they also represent the core of the research regarding Smart Cities”, says Jiang Chuyun from the National Smart City Joint Lab. Her office is located in a backcourt in West Beijing; the research centre is a kind of umbrella organisation for numerous research projects supported by the government. Communes, universities and enterprises all work together in these so-called Joint Labs. The Ministry for House Building and Urban and Rural Development selected local regions and development zones for the China National Smart City Pilot Project 193, which opened up access for them to a multi-billion dollar financial source with the national Development Bank. One of the Joint Labs is conducting research on a satellite-guided system for the analysis of urban traffic streams – data, which could be used later on for the set-up of intelligent traffic concepts. Another is conducting research regarding digital networking for subterranean pipelines. “The authorities are only aware of their own pipes – i.e. water, gas or piping for electrical cables. The project collects the relevant data in order to link these authorities with one another”, says Jiang Chuyun. The water authorities would thus know immediately which pipes run parallel to gas lines as well – important information for avoiding accidents. Numerous cities are already trying out the system”, says Jiang. In a further project, research scientists are working together with colleagues from the American Massachusetts Institute of Technology as well as the firms IBM and SoftStone on the intelligent surveillance of rainfall and water level in rivers in rainy regions. If these data are channelled automatically to transport authorities, they can give warnings much quicker regarding flooded streets. And another Joint Lab is testing sensors in buildings that measure the quantity of people in certain rooms, and regulates the room temperature accordingly. We need the enterprises in order to implement research results into action”, says Wan Biyu, Chief Scientists of the Joint Labs. Smart City concepts help in guiding urbanisation in the right direction – Wan is convinced of this. “Of course, it has to be done the right way. The master plan of a city must be suitable and the technology has to be carefully selected.” This is because it has to be a proper fit not only for the present – it also has to work in the future, once the city has developed further. China’s major cities have avoided several of the grievances typical for developing countries, such as the emergence of large-scale slums. There are nevertheless problems, for example the proliferation of cities due to insufficient land-use plans, water scarcity and the ever-present air pollution. Social services and educational facilities have not opened their doors to every resident in the city. The rigid household-registry system “Hukou” left over from the Mao era links individuals to their places of birth – and it is only in that place that they can take advantage of these services. Many migrants are thus not able to get health care services or take their children with them to the new place of residence. Only 35.5 percent of all Chinese are officially registered as city dwellers – a statistic that is considerably lower than the urbanisation rate of 53.7. The official percentage rate is predicted to rise after all to 45% - this represents an additional 160 million people, which would require reform throughout the entire Hukou system. That would cost a lot of money, because new schools, for example, would be required. China is taking part as a guest country in the Scientific Year 2015 sponsored by the Federal Ministry of Education and Research covering the topic of “Future City”. Both countries want to fortify their collaboration concerning environmental technologies for the conservation of water, soil and air, and network city administrators closer together in both countries. “It is particularly important to identify starting points for future research regarding future cities, i.e. rapidly-expanding urban regions”, the Federal Government announced in October. Joint events are planned within the framework of technology trade fairs or conferences in both countries.